The swim course takes place in the lagoon in front of Club La Santa, on the North West coast of Lanzarote. It is a one loop course and athletes will run past spectators and supporters on their way to the first transition. The bike course, challenging athletes with the strong island winds, goes straight through the heart of the island and the stunning scenery of fire mountains and wine yards. Participants will enjoy amazing views and will have lots of support from the volunteers along the way. Most of the bike circuit will be open to traffic but circulation will be controlled by the police. The run course starts and finishes in the Club La Santa stadium and consists of three 7km laps. Athletes will run through the fishing village of La Santa, whilst enjoying breathtaking views of the ocean and volcanoes under the Lanzarote sun. 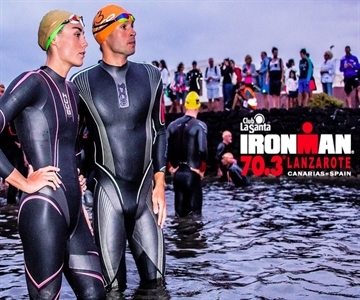 Competitors will be surrounded by warm support from spectators lining the run as they make their way to the finish line to become a Club La Santa IRONMAN 70.3 Lanzarote finisher. IRONMAN 70.3 Lanzarote 2018 offers 50 qualifying slots for the 2019 IRONMAN 70.3 World Championship in Nice, France. Strong pro field expected at CHALLENGE MELBOURNE: spectacle guaranteed! We will never share your email address or spam you. Copyright © 2009 K226 Triathlon. All rights reserved.